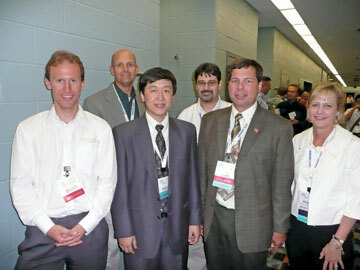 Newsletter Editor Janet O’Neil is shown with speakers from the “Advanced Topics for Antennas and Field Probes in Radiated Measurements” tutorial held during EMC 2008. Speakers included (from left) Alexander Kriz of the Austrian Research Center, Mike Windler from UL, Zhong Chen and Vince Rodriguez from ETS-Lindgren and Dennis Camell of NIST. Another Busy Symposium in Detroit! Hats off to Kimball Williams and committee for organizing another great symposium - this year in Detroit. The 2008 IEEE International Symposium on EMC had something for everyone and a unique gala that will be talked about for years. Who knew we had such energetic dancers in the EMC Society? One of the reasons I selected the above photo for this issue is that it showcases my greatest interest in the annual EMC Symposium – the technical program! I enjoy collaborating with the industry experts and in Detroit I had the opportunity to co-chair two new tutorials. It gave me an appreciation for all the speakers and the time it takes to put together a good presentation, not to mention an entire session. How does the technical program committee coordinate all the paper reviews – not to mention second rounds of reviews on occasion – assign papers, schedule rooms, publish CDs, keep track of copyright forms, etc.? There is so much work that goes into putting together a quality technical program for a major symposium. I offer my humble appreciation to those involved in the Technical Program at EMC 2008 – including Mark Steffka, Tom Jerse, Bruce Archambeault, John Maas, Keith Frazier, Scott Mee, Kin Moy, Tom Holmes, Candace Suriano, Bogdan Adamczyk, Rich Wiese, Flavio Canavero, Don Heirman, Bob Scully, John Norgard….and I’m sure there were many other people behind the scenes contributing to the success of the technical program! To all involved, kudos for your success! Back to the above photo; note you can get a glimpse of the crowd at the technical sessions. The aisles outside the meeting rooms were very busy during the breaks in the technical presentations. I liked that “buzz” of seasoned and novice EMC practitioners exchanging notes, debating techniques, postulating new theories and questioning old ones. We wouldn’t have seen that “buzz” if the technical program hadn’t generated discussion. Again, thanks to all involved in putting together a memorable technical program.